What could be better - a great Reb Shlomo Carlebach dance niggun - Orech Yamim - performed by Yehuda Green, in the Hornosteipel Rebbe's shul [of Rebbe Mordechai DovBer Twerski]. ENJOY! The day that Itzik Cohen and his wife were quarreling in the Beis Din, R. Yisrael Dan was sitting, as usual, with his head deeply into the sugya [subject matter] of the Gemara, but with 'one ear open' to hear of any Halachic part of the discussion. The case was a tragic one, which appeared to be heading in a very sad direction - divorce. Everyone there, the head of the Beis Din, the other dayanim, and the Rabbinic scribe, came to the unhappy conclusion: "We force him to release his wife with a get [bill of divorce], since they cannot live together, and one is not obligated to live under the same roof with a 'snake.' " In a clear tone, the judges informed the cold-hearted Itzik of their decision. As his anger welled up, he informed them, in a venomous tone, that he could care less about their decision. He has his own plans for his future. With determination, he put on his helmet and left the Beis Din, slamming the door behind him. He also left behind some pondering judges, and an aguna [a 'chained woman' who is stuck without a divorce]. The noise of his motorcycle resounded in their ears like a song of derision. With hearts filled with pain, they set an appointment to meet with the aguna, to discuss her plight, and how she might be released. As they sat to discuss her fate, the Av [head of the] Beis Din began, "This case is different from that of many others. There are two Halachic opinions about what to do in a case when a man is obligated to divorce his wife. One opinion of the Rishonim is one may employ means of force, 'we force him with lashes,' say these poskim. But another opinion is that one should not use force, but rather 'the court informs him that he is to divorce his wife, and if he refuses, he has violated the words of the judges and is called a sinner.' Since there are two variant opinions in the Rishonim, and the Halachic application of force is very complex, the Halacha goes according to the second, more lenient opinion: we don’t force him, but inform him, and one who disobeys is called a sinner." "But in this case, Rabbosai, the decision of the Beis Din has no effect whatsoever on this man," the Av Beis Din continued, raising his voice. "He is already a sinner, without our 'ordaining' him as such; it neither interests nor threatens him at all. In this case, it appears to me that, for lack of an alternative, we need to rely on the opinion of those who say to use force. We should therefore employ the [secular] law against him, including imprisonment and the like." A stormy debate began amongst the dayanim, and no one budged from the Beis Din until all the dayanim agreed with the Av Beis Din, that in order to release this poor woman from her plight, they would have to make an exception and rely on the first opinion as the Halacha in this case. "And what does R. Yisrael Dan say?" asked the Av Beis Din, as all eyes turned towards the corner where the safra d’dayna was sitting. His pen came to an abrupt halt, as he focused a sharp look at the dayanim. "In my humble opinion," he began, "we should not deviate one whit from the psak Halacha [legal decision] of the Shulchan Aruch. According to this psak, one should not force the man to give a get, even in a case like this one. This is based on the idea that force is not to be used as a first measure [l’chatchila]; and who are we to put our heads between these two mountains [the two great opinions]? True, ours is indeed a difficult case, but we must cling to the Halacha as it is. By strictly following the Halacha, one does not lose, and Hashem stands amongst His judges - He will do what is best is His Eyes!" This came as quite a surprise. The judges began to debate it over again, but in the end, as so many times before, the opinion of the safra d’dayna won out. Well aware of his yiras shamayim [fear of Heaven] and kedusha [holiness], they accepted his words as fully absorbed in the fear of G-d and His Torah. At the next discussion with the couple, the judges informed Itzik Cohen that he must immediately divorce his wife with a get, and if not, he was deemed a sinner! He was filled with scorn and ridicule. When the secular court and the police called him a criminal, he was not moved; when a group of bearded rabbis called him a sinner, he didn’t even blink an eye. Perhaps you might think that R. Yisrael Dan was so removed from worldly matters, that he couldn’t understand the plight of an aguna - Heaven forbid! After he became the Modzitzer Rebbe, on a trip to the US, a porter offered to carry his luggage for him upon his arrival. 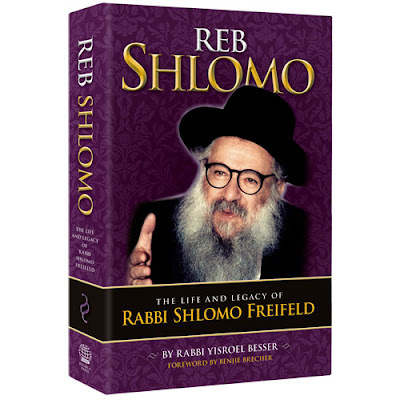 The Rebbe stared at him and recognized him. He had met him nineteen (!) years previously in the Beis Din, and he knew that since then his wife was an aguna, and that he - the husband - was not to be found. "Aren’t you so-and-so?" the Rebbe yelled at him. He tried to feign innocence, but the Rebbe would not relent: "Rasha [evil one]! Why did you make your wife an aguna?" The man tried to flee, but the Rebbe signaled his attendants, who caught him. They would not let him go until they sat down and had him give them a proper, kosher get. When they returned to Israel, they were able to free the broken-hearted, desperate woman from her state as an aguna. Despite this, R. Yisrael Dan did not look for ways that deviated from the simple Halacha. He does his part, and the Giver of the Torah [Hashem] will complete the task. In our case as well, the outcome was a clear indication of this, as we shall see. Only a month had passed since the painful case of the Cohens in the Beis Din, and Itzik Cohen was seen on the streets of Tel-Aviv with a stubble of a beard, and an old kippa on his head. His mother had passed away, and he was careful to fully observe the Jewish laws and customs of mourning. R. Yisrael Dan also walked the streets of Tel-Aviv, where an obituary notice caught his eye, describing the passing of one Chasiba Cohen. The address of the house of mourning was quite familiar, for many notices from the Beis Din had been sent there. R. Yisrael Dan knew exactly what he had to do. A brief investigation told him that Itzik Cohen was very likely to fully observe the Jewish laws and customs of mourning, including leading the prayer services three times a day. He davened at a shul called "Zecher Zilpa." Within a day, the attendant of the shul had received a registered letter from the Tel-Aviv Beis Din. "It has become known to us that one Itzik Cohen prays in your shul. You should know that our Beis Din has declared him a sinner. Therefore, he is not allowed to lead the services, and no honor should be accorded him, such as an aliya to the Torah, opening the Holy Ark, etc." Attached to the letter was a photocopy of the psak din, the judgment against Cohen. When Itzik came for services, the gabbai nervously informed him that although he had nothing personal against him, he would not be able to lead the services any more. He showed him the letter from the Beis Din, indicating that he was a sinner. Itzik couldn’t be bothered to think about the full implications of this. He merely went from Zecher Zilpa to Heichal Zalman. But within two days, the gabbai of Heichal Zalman approached Itzik, waving a familiar letter at him. "You cannot continue like this. Either come to terms with the Beis Din, or go…"
The walls of his heart were beginning to crack - but just beginning. He tried Maalos Kedoshim, and Yotzei Vasilkov, Mercazi, Shechunati, and even the shuls in the community centers. But someone was following him. Wherever he went, the long arm of the Beis Din found him, under the skilled guidance of the safra d’dayna. He was cast out of one shul after another for a full month! At the end of the month, he broke. Tight-lipped and downcast, he went back to the Beis Din, and released his wife from her state of aguna, which he had planned to keep her in for many years. The Beis Din had defeated the obstinate man, who was an 'avaryana d’dayna' - a sinner against the court - no more! This process was a considerably shorter one than any use of force might have been. The pure Halacha had won out. G-d stands in the Beis Din, and aids the dayanim and those who follow His true path. The Divine assistance that was accorded to Rebbe Yisrael Dan - whose fear of Heaven preceded his wisdom - took this woman out of her plight. Zechuso yagein Aleinu v’al Kol Yisrael - May the Nachalas Dan’s merits protect us all! Today, 20 Sivan, was the second Yahrzeit of the previous Modzitzer Rebbe ztvk"l, Rebbe Yisrael Dan Taub, known as the "Nachalas Dan." As the neon lights shone, and the enchanting music was played at their wedding, the newlywed Cohens [not their real name] were certain that these sights and sounds would accompany them forever. Unfortunately, this illusion would not last too long. Soon the bright lights became blinding, and the pleasant sounds turned to screeching, as Mrs. Cohen discovered, to her horror, that she was married to an evil man. Life became a nightmare as the decibel level in their home soared and resounded throughout the neighborhood. She tried everything to get her husband to change his ways: sometimes with soft words, at other times harshly - but to no avail. Itzik Cohen was so corrupt that neither words nor feelings could penetrate him. Mrs. Cohen soon realized that she could not live with him any more. Broken-hearted, she went to the Beis Din [Rabbinical court] to initiate divorce proceedings. The Tel-Aviv Rabbinical court [Beis Din] is a house of tears. It was here, before its dayanim [judges] that the Cohens came for their hearing. With pain-filled hearts, despite the multitude of similar cases that had come before them, the judges listened to the plaints of this unfortunate woman, who described her plight. A quick glance at her husband’s face gave them a strong indication of the veracity of her words. His blood was beginning to boil. After a few minutes of hearing his wife’s accusations, he burst into a fury of curses and angry screams, which even stunned the judges. But his face shone. The joy of Torah-learning filled his entire being. Beads of sweat formed on his brow, clearly indicating the intensity of his deep learning efforts, which absorbed him completely. The dispute in the Beis Din reached fever-pitched tones, but he didn’t seem to hear them. He only heard Abayei and Rava; Rashi and Tosfos; the Rif, the Rosh, and the Ran; the Tur and the Shulchan Aruch; the Rama, the Chelkas Mechokek and the Beis Shmuel. He was the Safra d’Dayna, the court 'scribe', but not the scribe of Itzik Cohen and his family. The three dayanim tried to calm Itzik Cohen down, but he was impervious to their efforts. His outbursts continued, and it seemed as if he was about to tear the walls of the Beis Din down. His behavior confirmed his wife’s claims. "Calm down, Mr. Cohen, this is contempt of court…"
Immediately, the niggun subsided from the man who had been engrossed in his learning. As soon as he heard a word that had to do with the substance of the Din Torah [case], his pen was in hand and he quickly wrote down the Halachic [legal] arguments of the various sides. Here there is no quibbling, this is a debate amongst the poskim, Rishonim and Acharonim [early and later legal authorities], whose words are Torah-true. It doesn’t matter that these words are being recorded in the Tel-Aviv Rabbinical court. The defendant opened his mouth, again, with words that were irrelevant to the case - just a way of "letting off steam." The scribe dropped his pen, and his eyes quickly returned to the Gemara. This continued back and forth for the length of the discussion. This scribe was none other than Rebbe Yisrael Dan Taub Ztvk"l, [then] son of the Modzitzer Rebbe, Rebbe Shmuel Eliyahu [the "Imrei Aish"]. 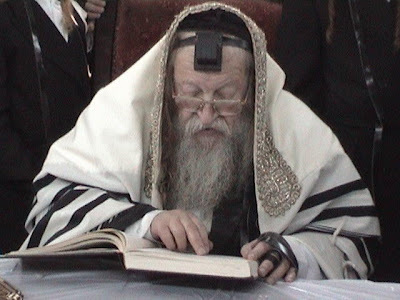 He would later succeed his father as the Modzitzer Rebbe, which he was for 22 years: eleven of them in Tel-Aviv [1984-1995] and the latter eleven in Bnei Brak [1995-2006]. 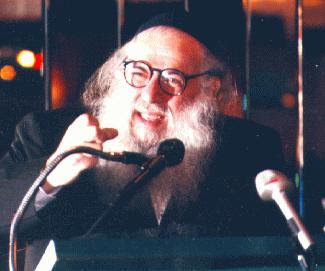 Some of the strongest teachers and people who have influenced my life were named Shlomo: Rabbi Shlomo Freifeld, my Rosh Yeshiva who took me under his wing in his very special Yeshiva, Shor Yoshuv, several decades ago; Rebbe Shloime Twerski, who helped me and countless others appreciate the depth of Chassidus, and how it could be lived in today’s world; and Reb Shlomo Carlebach, whose music, stories and teachings have inspired me till this day. So what a wonderful find when my good friend Moshe Kempinski of Shorashim included this piece below from Varda Branfman, in his weekly Jerusalem Insights mailing - with all three Shlomos therein! Thank you, Moshe, you made my day/week! I have included some of the comments from the Aish HaTorah website, which published this article. When I was transitioning from childhood to adulthood in the late Sixties, Bob Dylan's songs were a lifeline. So much of my time was spent living in the box. I ate, breathed, and slept S.A.T. scores and college applications. I lived in a highly competitive world where I was expected to accomplish great things. And there were those Bob Dylan lyrics talking about the coming times when "the last would be first," about white doves that sleep in the sand, about a Tambourine Man and other things that resonated with a place in me I was beginning to locate -- called my "inner world." There weren't too many people who seemed to care about the existence of an inner world, but I didn't give up trying to find them. In my sophomore year of college, I noticed a lot about the inner world in the poems of the French Symbolists, especially in Rimbaud who also happened to be one of Dylan's favorites. After graduating from college, I worked at a good job in television for two years. Then suddenly, I dropped out and moved to Maine. A number of factors contributed to my unorthodox decision: my father's death, a love of nature, attraction to solitude, and burning questions about life that were not getting answered. I had always been afraid of really blowin' in the wind, but now I felt the need to untether myself. Like his Sixties' songs, the Dylan songs of the early Seventies were good company next to my wood burning stove on a Maine winter's night. They spoke about keeping to your true North and what happens when you don't, aligning with your vision and your dreams, and about being real with yourself and your feelings. I wasn't always enthralled with those songs, especially when he sang about women. Certain songs even made me angry. I was no card-carrying Dylan fan. So how did he help to get me here, living a religious life in Jerusalem, the last place I would have ever imagined myself being? Dylan seemed to operate from the inside out, instead of the outside in. He had an artistic integrity that made him follow his inspiration wherever it took him. It didn't mean that he never admitted to getting confused, which he did quite often in his lyrics. But he saw the confusion and the clarity and the hope and the despair as all part of some very big picture, and he accepted it all and tried to squeeze all of it into his songs. Dylan knew how to go knockin' on Heaven's door, and in general, there was a certain G-d- consciousness in the underpinnings of his songs that were full of Biblical imagery. By the early Eighties, I didn't even notice Dylan's stint with Christianity because I had already made the decision to go for broke in search of my Jewish soul. By then I had more than enough to feed my inner world by singing Shlomo Carlebach songs and traditional zemirot around a Shabbos table in the Old City of Jerusalem. My first few years of marriage were spent in Denver. During one of our long conversations, Bob Dylan's name came up, and my husband acknowledged that he had also been significantly influenced by Dylan. My husband had been certain that his rabbi, Rabbi Shloime Twerski, obm, would be one of the few Jewish figures who could speak Dylan's language and open the door for him to Judaism. He was so certain that when he was in California, he went over to Malibu where Dylan lived and tried to find him. He parked his car down the block and walked over to what he thought was the approximate location of Dylan's house according to the information he had. The house was high up on a bluff, and there was an older woman standing in a flower bed halfway down the hill. He figured it must be Bob Dylan's mother. She was wearing a bandanna and pedal pushers. As he approached, she noticed him and the tzitzis and kippa he was wearing. My husband figured it was best to go straight to the point about why he had appeared, unannounced and uninvited. "I'm looking for Bob Dylan. Is this his house?" "No, Bob lives up the road. I'm not at liberty to show you where, but why are you looking for him?" My husband realized he had gone on a wild goose chase. He felt a stab of disappointment and wasn't interested in making conversation, but the lady seemed so nice that he felt she deserved an explanation. "It's because of my rabbi, Rabbi Shloime Twerski. I just wanted Bob Dylan to meet him. I think it could change his life." The lady's eyes opened wide when she heard the name "Twerski." Turns out she was Jewish -- the wife of a famous movie producer - grew up in Milwaukee, and knew the rabbi's father. "Oh my G-d! The Milwaukee Twerskis! My father used to take me to the rebbe! Everyone in Milwaukee knew him. Everyone respected him. No judge, Jewish or not, would decide on a case until they talked to the rebbe. And no lawyer would take a case until they talked to him. The Milwaukee Twerskis..."
She shook her head as if the words couldn't do justice to her memories. "Young man," she said, "I really want to help. You know what -- here take this piece of paper and write down a message for Bob, and I'll see to it that he gets it." That was as close as my husband ever got to Dylan. Nine months after we were married the rabbi passed away. It would have to take someone or something else to wake Dylan up to his Jewish soul. Dylan's songs, a kaleidoscope of observations and impressions about life, showed me how the world around me was communicating and I should listen to her music. For example, this morning while walking to the corner store, I saw a Burial Society van pull up to the sidewalk and pick up a group of little girls with their schoolbags. How incongruous -- even bizarre - I thought, that the same van would be used to transport the dead. Then the words "Chevra Kadisha," whose literal translation is "Holy Brotherhood," emblazoned in white letters on the dark van, started to unhinge from their usual association with the Burial Society. I realized that the band of little girls climbing in were another type of chevra kadisha, a sweet holy sisterhood of innocent souls on their way to school. No earthshaking epiphany, but it was a sign that my heart was awake. Like Dylan, I was trying to listen to the precious music. Bob, wherever you are, thanks for the lifeline, and for being part of the Master Composer's great orchestration. * Jerry 6/18/2008 11:41:00 AM - I remember that night: I was learning at Shor Yoshuv at that time. Reb Shlomo, OBM, always had bachurim at his house. But that night the word was out no one was to come. He was speaking with Bob Dylan that night. It says a lot about Reb Shlomo that he would speak with anyone and that his Yeshiva was open to anyone sincerely looking for Yiddishkeit. You should have seen the mix of people learning and shteiging there. Anyone that learned at the Yeshiva in those days or spent a Shabbos or Yom Tov there was very fortunate. Such experiences are so rare. Do we appreciate them? Mordechai Shuali 6/16/2008 11:13:00 AM - Knock, knock. Who is there? - It is not enough to knock on Heaven's door. One must go in. In fact one may not even have to knock at all. The door is always open. Rabbi Freifeld once commented that someone who finishes Chumash and Rashi is more accomplished than (fill in the blank). Ms. Branfman is far more accomplished than her idol of the past. He had his chance and did not grab at it. Author Biography: Varda Branfman is the author of I REMEMBERED IN THE NIGHT YOUR NAME from Carobspring Press. She runs virtual writing retreats and often writes about her lifelong interest in using writing for healing on her blog writingforhealing.blogspot.com. There’s still a little bit [of] the smoke of Auschwitz sometimes, especially in the Holy Land. Friends, there’s some people who would like to blow the gas of Auschwitz towards the Holy Land, don’t kid yourself! We have to be strong, strong on our feet. Friends, I want you to yell, "Am Yisrael Chai!" Israel is living, the Land is living, the Land is our Land, Jerusalem is our City! I want you to know, beautiful friends, and I’m not talking now [of] political peace, I’m talking about - a Jew should know where it’s at. I want you to know that G-d gave the Land to Abraham, when G-d says to Abraham, "Walk around in the Land, this is the Land I am giving you." It’s our Land! IT IS OUR LAND! Gevald, it is our Land! Do you know, every inch of the Land is full of [the] blood of our holy soldiers. Do you think they gave their lives so that afterwards we should spit at them and just say, "Ah, I’ll trade it in for a few million rubles that Brother Clinton will give us"? No, 100 percent NOT! Friends, I want us to stand on our feet and yell, "Am Yisrael Chai!" Israel is living, forever! The Land is ours forever! And it’s the land of our children, of our grandchildren, and nobody can take it away from us!! !